Columbus Day is a unique day in the school calendar because Beth has it off, but the kids don’t. Because a lot of families are in this position, our county’s public schools have Open Houses on this day. Depending on the school, you can come for part or even all of your child’s school day and watch it in action. I’ve always enjoyed this, as well as the opportunity to steal a little too-rare time alone with Beth. After considering various ways of configuring the day, we decided to attend two of Noah’s classes—Media because it’s his favorite, and science because it’s immediately before Media—then go out to lunch and visit June’s afternoon class, which is the English half of her day. That way Beth could understand what people were saying. Plus, I’m already signed up to volunteer in June’s Spanish class later this fall, so I’ll get a chance to be a fly on the wall there some other time. 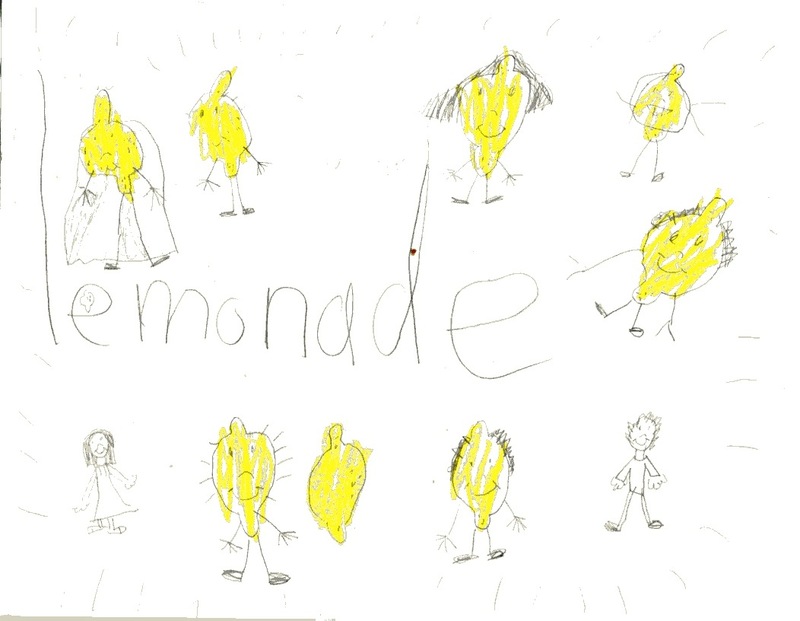 We also scheduled June’s lemonade and hot cider stand for Monday afternoon, thinking that many working parents who wouldn’t be able to bring their kids on other days could do it this day. Like June’s last out–of-season lemonade stand (“Spring Break Trilogy: Part 1,” 4/18/11), this one was a reward. Ever since we finally took June’s pacifier away last spring, she has not slept as well as she used to (which was never very well, as long-time readers know). I was hoping to reduce post-bedtime out-of-bed wandering, middle-of-the-night wakeups and early morning intrusions into our room to roughly the level where they were six months ago. I promised she could have a lemonade stand if she could stay in bed all night and stay out of our room and quiet (this part is key) until 6:30 on weekdays and 7:00 on weekends for at least 80% of the days in any given month. Well, September was the month it finally happened. The depressing thing is the main reason she met the benchmark is that I lowered the bar for what counts as noise in the morning. Once middle school started and Noah was getting up at 5:45 on schooldays, turning on lights and opening and closing doors, it hardly seemed to matter whether or not June was singing songs from Annie in her room at 6:15. I did draw the line at screaming arguments about bathroom access right outside my bedroom door, even if they did considerately close my door before commencing to scream. (They think perhaps it’s soundproof?) So, I didn’t feel as celebratory as I might have otherwise when I counted the stickers on the calendar and found there were twenty-four, but a promise is a promise. 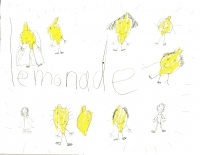 I asked her if she’d rather have a cider stand, since it is cider season, but in June’s mind a lemonade stand is a legitimate business enterprise and a cider stand is just some bizarre idea her mother had. So we compromised. It would be a lemonade and hot cider stand. To advertise the dual beverage stand, I sent a message to the listserv for June’s preschool class, which is still relatively active, and to the listserv for her old basketball team, I posted it as an event on Facebook and I sent out email to pretty much anyone I could think of who’d invited June to a birthday party or play date in the past year or so who wouldn’t be covered in the other categories. I started my advertising blitz the Wednesday before Columbus Day and by Saturday I was getting nervous because I’d had a few people contact me to say they couldn’t come (because of parents who didn’t have the day off, a child’s yoga class, a family trip out of town, etc.). A couple other people said they might come, but not a single person had said he or she would definitely be there. I wondered if this was going to be a huge flop. I told myself we’d worried about the same thing last time, when she had a lemonade and hot tea stand on a cold, rainy April afternoon and it turned out fine. Monday morning at the school bus stop, I spread the word about the stand to any parents I hadn’t already buttonholed the week before. When June got on the bus I told her I’d see her in her afternoon class, and Beth and I headed over to Noah’s school to observe his second and third period classes. They were doing a lab about motion and force in his science class. The experiment consisted of rolling marbles down a chute and into a paper cup and measuring how far the paper cup moved. Half the class was using mass as a variable so they had different-sized marbles. The other half was using acceleration as a variable so they arranged the chute at different angles. The teacher said they would discuss the results of the experiment on Tuesday and dismissed the class. We’d intended to walk with Noah, but he sped ahead of us. I’m not sure why. Did he not want to be seen in the halls with his mothers? Was it a game? (He kept looking over his shoulder at us and grinning.) Was he trying to impress upon us how little time he has to get from class to class, or was he genuinely hurrying so as not to be late for class? Who knows? Next we went to an inter-period session called PBIS (Positive Behavior Incentive System) he has on Mondays between Science and Media. All the other days of the week it consists of reading for twenty-three minutes (which I am all for) but apparently on Mondays they focus on some positive behavior or attitude they want to encourage. Today it was disability awareness, which again, I support, but it was really poorly done. The kids were disengaged and the teacher didn’t do much to engage them but just plowed ahead with a presentation that mainly consisted of naming historical figures and celebrities with various disabilities. For the most part the kids didn’t even recognize the names and the teacher let a comment about having a disability meaning you were “mental or retarded” slide. Wadded up papers and rubber bands flew through the air. Noah sat near the front and attended to the screen, though, so it’s possible he may have gleaned some interesting tidbit he’ll remember from the presentation. He’s good at picking up information under less than ideal circumstances. It was a relief to go to Media. They are doing some interesting work in this class. Right now he’s working on digital children’s book, based on a story YaYa told him this summer. (He has to tell the same story in various formats. He’d already done an oral presentation on it.) I’d hoped to see them working on a hands-on project like this, but they were starting a unit on newspapers and they watched a video on what reporters, editors, graphics people and printers do. It was a bit out of date (1999) so the teacher kept stopping the video to explain how technology has changed at newspapers since the video was made. As the daughter of newspaper editor, I did find it interesting. At the end of class, we said goodbye to Noah and left. Beth and I had lunch out at Roscoe’s (I got beet and goat cheese crostini and a salad with argula, apples, gorgonzola and candied walnuts) followed by coffee and pastries at Takoma Bistro before it was time to go to June’s afternoon class. June did not run away from us. She waved and smiled and came over for kisses and hugs. Perhaps this is the difference between first grade and sixth. We directed her back to her work. Over the course of about an hour, she worked with the teacher and her reading group, writing a summary of a story they’d read and then she went back to her table and did a huge pile of language arts worksheets. Once she’d finished, she selected a book to read. We told her goodbye and went home. Overall, I felt the instruction we witnessed (with the exception of Taking Care of Business) was competent but not inspired. I get the sense this was probably representative of June’s day, but possibly not so much of Noah’s. Having so many different teachers it’s hard to get a representative look in such a small slice of time. I also know his Media class is frequently more innovative than what we saw. As I mentioned it’s his favorite class, and the only one in which he currently has an A. The transition to middle school’s been bumpy for Noah. He keeps forgetting to turn in his homework, work he completes diligently every night, and it’s hurting his grade in most of his classes, not to mention driving Beth and me insane. Once home, I resisted the temptation to do any preparation for the stand before June got off the bus because I knew she’d be full of nervous energy and it would be better to let her work it off making lemonade and setting up the table on the porch with a tablecloth, paper cups, mugs for cider, a little papier mâché dish for her profits and her butterfly bank to make change. I filled a big pot with cider and set it to simmer on the stove with two cinnamon sticks. The very last thing to do was to tape her sign to the gate and by 3:28, two minutes ahead of our advertised start time, we were ready for business. It was overcast and about fifty degrees. June shivered in her seat and dashed inside for a cardigan. Beth had gone to pick up some cannoli for dessert (we had a coupon for a half-dozen free mini-cannoli from Vaccaro’s) and she’d picked up Noah along the way. Shortly after the stand officially opened they came home and were June’s first customers. Around 3:40, June’s classmate Will and his mother and younger brother arrived. The boys had two cups of lemonade each and his mom and I discussed having Will come over for a play date. June’s recently taken a shine to him. There was a bit of a lull, and then June’s best friend Megan and her parents and younger sister were coming down the sidewalk, followed by Lesley, and June’s old preschool classmate Merichel and her father, younger brother and a school friend of Merichel’s. We haven’t seen Merichel’s family in ages, so that was nice. Because Megan’s younger sister and Merichel’s younger brother are in the Tracks and Leaves classes at the Purple School, Lesley found herself surrounded not only by former students but also by current ones. Megan’s sister, who’s new to the school, was shocked to see Lesley. “Teacher!” she exclaimed, as if surprised Lesley even existed outside the classroom. 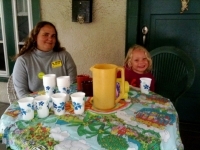 We were quite busy for a while there pouring cider and lemonade, cleaning up spilled lemonade and making change. Both Jeff (Merichel’s dad) and I were trying to get our daughters engaged in the mathematical aspect of the transactions. A lot of people had seconds so I needed to heat more cider and make another pitcher of lemonade. By 4:20, all the customers had left. June and I stayed in our positions until 4:30, but that was the end of it. The change June brought to the table got mixed with the money people paid so we couldn’t tell exactly how much she made, but it was at least $7. (I think we must have charged more than last time.) Anyway, June was well satisfied with the whole experience. For dinner I made a brandy-laced vegetarian chicken soup, ladled over garlic bread and with Parmesan cheese sprinkled on top because I read on the Internet it was a favorite of Christopher Columbus and if it’s on the Internet it must be true, right? Anyway, the kids both ate it, much to my surprise. And for dessert we had the cannoli, because Christoper Columbus had to have liked cannoli. That goes without saying. It wasn’t a perfect day. I’ve seen better teaching at other Open Houses, and it was really dreary day for a lemonade stand. Also, I was feeling sad, for private reasons. But we did get a glimpse into the children’s school lives, another against-the-odds lemonade stand success, a tasty meal out and another at home. Some days you just have to take the cannoli.